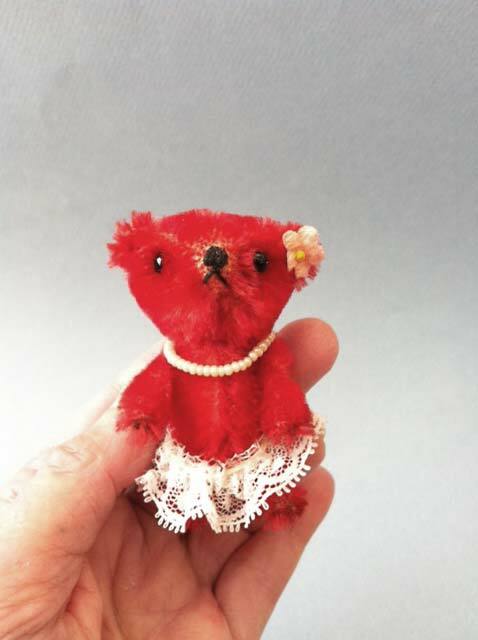 Emaline is a miniature mohair artist bear. She is only 2 1/2" tall and was hand stitched. Her mohair was hand dyed and shaded. She is wearing a vintage lace skirt, a necklace made of vintage glass beads. She has glass eyes and an embroidered nose and mouth. Emaline has tiny stainless steel shot in her tummy to give her a little weight and to help her sit nicely. She is available in my Etsy shop. I have 8" x 10" giclée art prints of the following paintings in my Etsy shop. "Elephant Showtime" is a mixed media acrylic painting with collage and color pencil. "Elephant with Flowers and Mushrooms" is a mixed media watercolor with charcoal, inks, and color pencil. "Girl with Scarf" is a mixed media acrylic painting with collage and color pencil. "Ghosts are Coming To Dinner" is an oil with pencil painting. Two new Ellifolks critters are now in my Etsy shop along with two new art prints. Johnson, a mohair artist bear is hand dyed and hand shaded to give a rich, vintage coloring. I used a sparse mohair for Johnson to add to the vintage look and feel. He has one glass eye with a wool felt edging and one vintage shoe button eye ringed with a red embroidered circle. His circle nose is embroidered with pearl cotton thread. He is stuffed with excelsior and cotton batting. Harriet Rabbit and Sam are a hand dyed and hand shaded pale pink rabbit and a hand dyed and hand shaded pale green chick both made of sparse German mohairs. Harriet Rabbit is approximately 8" tall including ears and is cotter-pin jointed for a vintage feel. She is wearing a needle-felted purple polka dot hat with cotton lace trim. She has German glass eyes and a pearl cotton embroidered nose and mouth. She is stuffed with excelsior and cotton batting. She has steel shot in her tummy to give her a nice weight. Sam Chick is approximately 4 1/4" tall including his purple glass bead legs and feet. He has a needle-felted comb and beak and German glass eyes. He is stuffed with excelsior. "Boy With Dog" is a fine art giclée print of one of my original color pencil and digital paintings. I did a drawing with color pencils and then scanned it into my computer. I colored it in Procreate using many layers and types of digital brushes. "Girl With Poodle and Flowers" is a fine art giclée print of one of my original mixed media/acrylic paintings. This was painted on a cradled wood panel. I started with a very textured layer of gesso and incorporated the texture into the painting. I also used pencil and color pencils in the painting. "Sail" is a digital painting I made in Illustrator. I like the combination of the clean, flat shapes with gradient color. "Dolls with Donuts" is a digital painting I made in Illustrator. I have added two digital paintings to my Etsy shop. This painting is titled "Shopping". It was painted on my ipad using the Procreate painting app. You can visit its Etsy page here. This painting is "Susie's Daytime Dreaming". It was also painted on my ipad using Art Rage and Procreate apps. You can visit its Etsy page here. I was very excited and honored to see my tutorial, "Using an IPad for Help with Painting Design Decisions", published in the Spring 2014 issue of Somerset Digital Studio. In the article I talk about how I use the iPad for help with deciding the direction to take with paintings when I am feeling unsure about adding, changing, or deleting something. The article is based on my blog post, "Tutorial - IPad And ArtRage for Help with Painting Design Decisions" which expands on the article. Thank you Jana Holstein for publishing my tutorial in this beautiful issue. Procreate is my favorite digital painting app. The basic tools are easy to use, but if you want to delve into sophisticated, complex digital work, you can with Procreate. A 189 page handbook comes with the app and goes step by step through Procreate's various tools and techniques, including brushes, layers, iPad gestures for Procreate, transform (enlarge, reduce, or distort a layer), and selections (select area, then copy and paste). When you open the Procreate app it brings you to the Gallery. Click on the plus on the top right corner. Pick the size canvas you want and the canvas view will open. Below is the Procreate canvas with icons around the top and right sides. Clicking on Gallery takes you and your current painting to the gallery. Paintings are saved there with their layers intact. The second icon from the left, the little wrench is the Actions menu. Here you can import photos, export the painting, flip or copy the canvas, and get help with the app. You can also save directly to the photos app, upload to Facebook or Twitter, or even email a painting. The next two icons, Select (lightning icon)and Transform (up angled arrow) are not needed for basic work, but are covered in the handbook if you want to explore using them. Moving along the top of the canvas to the right, the next icon is Brushes. Clicking on it brings up a drop-down menu from which you can select the brush you wish to use. There is a large selection of brushes. Clicking on one selects it and a double click on a brush turns the menu over to an options menu for that specific brush. This gives you a lot of variety for each brush. Next to the Brushes icon is the Smudge icon. Clicking on Smudge, then rubbing on a painted part of the screen will smudge the colors. The icon to its right is the Eraser icon. It uses the same brushes as the Brush icon and can vary size and opacity using the sliders on the side of the canvas. After you select a brush, you can vary its size and opacity using the two sliders on the right of the canvas. The top one changes the size, increasing it as you slide up. The bottom one changes the opacity, increasing it as you slide up. Below the Opacity Slider is the undo arrow with 250 undos. Clicking the colored square icon in the top right corner of the screen opens up the Color popover. There are hue, saturation and brightness sliders that can be adjusted to pick precise colors. Now you have picked your brush type, size, and opacity and your color. You are ready to start painting. You can use your finger to paint with, or a stylus like the Wacom Bamboo stylus shown below. I like using a stylus, as it feels more precise than my finger and also lifts my hand up off the screen some so I can see the area I'm working on better. The icon to the left of the color swatch is the Layers icon. Clicking on it brings up a drop-down menu showing all the layers. Your first strokes will automatically go on the first layer. Layers drop`down menuResize by dragging with the right mouse button. First strokes appear on Layer 1. Here you can see the different effects you can get from using various brushes. To add a new layer, click on the + icon in the Layers drop-down menu. The added layer has a black background meaning it is the active layer. Paint strokes will appear on the active layer. You can change the active layer by clicking on the layer you wish to be active. Here I painted with different brushes on the second layer. They appear above Layer 1 both in the Layers drop-down menu and on the canvas. Layer two is on top. Here layer two has been moved down below layer one. It shows as under everything on layer one and now becomes the background. You can move layers by holding on the layer you want to move until it appears to lift up. Then drag it to the layer position you want. Now strokes on Layer 2 are below layer 1 strokes. Layers are very helpful in working in Procreate. I tend to use a lot of layers and like to keep backgrounds on separate layers and objects that are touching or on top of one another on separate layers. If I am doing a face, I would keep the outline, the fill color, the face details - eyes, nose, mouth, and hair all on separate layers for working. Then if I want to change the hair, for instance, it is easy to do without messing up the face outline or fill. A Few Tips for Working: Painting on such a small surface as an iPad makes painting details hard to do precisely. To magnify and get a close-up view, pinching out with two fingers works in the app as it does in Safari and many other iPad apps. I use this option for anything that needs precision. Also a quick pinch together and then lift of two fingers sizes the painting to fit the shown canvas. Have fun trying out Procreate. If you would like to show what you have created with it, you can leave a comment with a link to your painting. I have added five new pieces - four digital paintings and an Iphoneography photograph to my Etsy shop. If you click on the images, it will take you to their page in my Etsy shop. I have added three new prints to my Etsy Shop. "In the Afternoon" is a digital painting made on the iPad. It includes some of my favorite subject matter - a chair and flowers, and has a feeling of calm relaxing in the midst of some chaos. Here is it's Etsy page. "Get Down Cat!" is a digital painting also made on the iPad. Again there is a chair and flowers. A mischievous cat is not about to give up her comfy spot on the back of the chair. Here is it's Etsy page. "6 Doll Heads" started out as a photo of one of my original dolls taken with my iPhone. I manipulated the photo in several photo editing apps and combined six images into one iphoneography photo collage. Here is its Etsy page. I like using the iPad for decision making when I get stuck on where to go next in the painting process in acrylic painting. This technique can be used for any art medium. I I use either the ArtRage or Procreate apps. In this tutorial, I am using ArtRage. To get the painting into the iPad, I take a photo with my iPhone or iPad of the painting trying to get close enough so the painting covers as much of the painting as possible. I open a new painting in the ArtRage iPad app. Below is a screenshot of the ArtRage interface with a new blank painting. As you are working, the row of tools and the color picker will disappear when you click on the active tool and color giving you more canvas to view and work with. Then I import the photo of the painting into ArtRage. Click on the second to right bottom icon to import the photo. It comes into the program as a tracing image at 40% opacity. To see the painting at full opacity, click on "Convert to Paint" under tracing options. Tracing options is the third icon from top in the same bottom icon. It looks like three horizontal lines one below the other. Then click on the eye icon , and the painting will show at full opacity. I add a new layer above the painting so I am not working directly on the painting. The fourth icon fron the right on the bottom of the ArtRage interface is the layers icon. I paint on new layers, keeping objects and new painted effects on separate layers. This way I can turn on or off the visibility for each layer to see what I like or don't like. I generally use the watercolor or oil brushes, but may also use crayons and color pencils. Each brush has several settings for different paint looks. You can change size and properties of each brush by clicking the two left bottom icons. Both control different brush properties. For this painting, I was unsure if I wanted to add a planter and flowers. I added a planter on the floor. Then I added flowers and a plant -- all on separate layers. I turned on and off the visibility on the various layers and saved versions or took screen shots of the various versions. Although the added objects will not look the same when added to the painting, they are similar enough to help me decide if I think they will be good additions. Here is the finished painting. You can see that I did add the planter, but not the flowers and plant. I also experimented with adding layers of color to certain areas and did so on the painting itself. I have added two prints to my Etsy shop. "Circus Dreams"started with an acrylic painting for the background. It was scanned into my computer and transferred to my iPad. I used the paint app, Procreate to create the rest of the imagery. Then I used two photography apps, Halftone and Blender to get the final image. 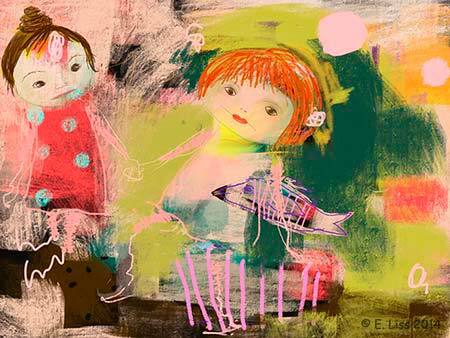 The second print, "Girl with Saucer Flowers", is a digital print made on the iPad using the paint app, Procreate. I like to use many layers and a variety of brushes to get depth and complexity in my digital paintings. I'd love to have you come take a look. I just added a new digital painting print, Jane with Flowers and Bunny, to my Etsy shop. I had a lot of fun playing with layers and using a variety of brushes. You can see the print here. I just added my first print of one of my paintings to my Etsy shop. The original is an acrylic/mixed media painting on hot press watercolor paper, done in many layers and incorporating pencil and water-soluble oil pastels, too. I will be adding more prints shortly. I have to thank Mindy Murphy Lacefield for her wonderful online class, "Paint Your Story". If you get a chance to take it, I highly recommend it. She really gives you the tools and encouragement to find freedom in your art.